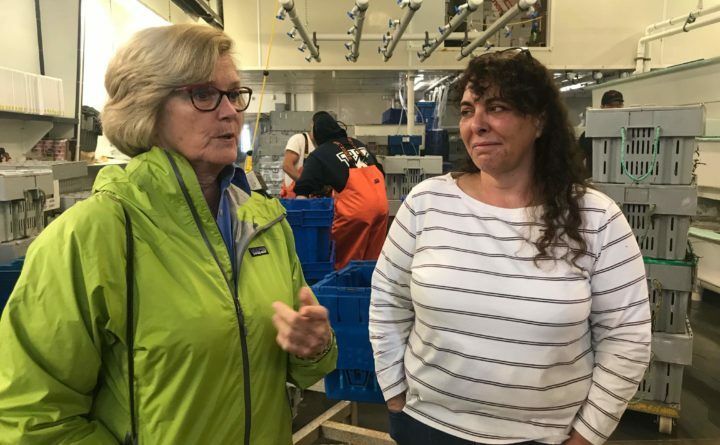 U.S. Rep. Chellie Pingree, D-Maine, talks with Stephanie Nadeau, owner of The Lobster Company in Arundel about China's 25 percent tariffs on lobster in retaliation to the Trump administration's trade stances. ARUNDEL, Maine — Some 140 million pounds of lobster are caught in Maine each year. Stephanie Nadeau, owner of The Lobster Company, told Congresswoman Chellie Pingree that she ships millions of pounds of live Maine lobster from her wholesale business on Route 1 in Arundel each a year, with a focus on China. “Each shipment is normally 2,000 to 3,0000 pounds and I ship four to six shipments a day,” Nadeau said Wednesday. Those shipments have come to a grinding halt due to a 25 percent tariff China placed on Maine lobster in retaliation for the Trump administration trade actions. The tariff has severely tightened what has been one of the Maine lobster industry’s largest export destinations in recent years. Pingree met with Nadeau Wednesday on the floor of The Lobster Company’s processing plant. The two spoke about how Nadeau’s business has been impacted by the Chinese retaliatory trade tariffs. Nadeau said she had to cut one-third of her wholesale staff because of the slowdown in shipping. Canadian lobsters have taken the place of Maine lobsters in shipments to Asia, said Nadeau, but they can’t keep up with the demand. Maine lobsters are being hauled across the border and shipped out from Canada, but trade officials are cracking down, so that practice has slowed, she said. That’s one 2,000-pound order on a day she would normally ship four to six. And, as she said, there will be more live lobster arriving off the waters of Maine tomorrow and the next day. Nadeau, who co-owns the company with her husband Michael Marceau, buys about 10 percent of her lobsters directly from lobstermen, and the other 90 percent from other Maine dealers. Nadeau is just one of many dealers in Maine whose primary markets are China and Europe, Pingree said. The effects are being felt up and down the Maine coast. The international seafood brokers are looking elsewhere, mainly north to Canada to fill their orders. “Who can blame them? I’ve asked them can you please direct me to another fish eating country with 1.5 billion people and I’ll fly there tomorrow. There isn’t one,” Nadeau said. Pingree has worked with the rest of Maine’s congressional delegation to communicate the plight of the industry to the Trump administration and urge action to restore the market. Pingree also co-sponsored a bill with Rep. Seth Moulton, D-Mass., to provide disaster relief funding to all parts of the lobster supply chain harmed by the latest trade actions. Pingree knows it’s a Band-Aid approach to a big problem. “There’s no logic behind any of this, and everyone is asking what was the desired end result,” she said. Meanwhile, Nadeau waits for an end to the tariffs that are crippling her business. What’s happening with all of those Maine lobster that would be shipped to China? “They are getting some nice lobsters right here in southern Maine this year, they really are. The boat prices are holding, but the dealers aren’t making any money,” Nadeau said. If the retaliatory tariffs continue when all the tourists leave in a few weeks, she won’t make any money this year. “It’s going to be tough. I’ll just break even, at best,” she said.